Like changing the oil in your car prolongs the life of your engine, proper maintenance improves print quality and prolongs the life of a printer. DPI printer maintenance kits keep your printer in optimal condition. These kits provide all of the parts necessary to perform do-it-yourself maintenance on your printer to help extend your printer's life. All of our maintenance kits offer market-leading quality and OEM performance, at a significant cost savings. The entire DPI line is manufactured in state-of-the art facilities and supported by a best-in-class warranty and technical support program. 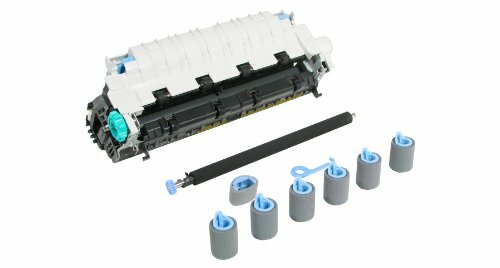 This maintenance kit is compatible with HP LaserJet 4200, 4200N, 4200TN, 4200DTN, 4200DTNS, 4200DTNSL and includes 1 Fuser, 6 Feed/Separation Rollers, 1 Tray 1 Pickup Roller, 1 Transfer Roller, 1 Separation Pad. It has an expected yield of up to 200,000 pages dependent upon print environment and media used.